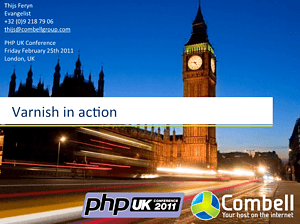 The PHP UK Conference took place in London, on 25 February. This community conference is also one of the most important PHP conferences in Europe and attracts more than 500 people every year. As in the previous year, the event was held in the Business Design Centre. Thijs Feryn, our technology evangelist, was also part of the programme and presented “Varnish In Action”. Varnish is a reverse caching proxy that has now become the “de facto” standard to make large-scale page caching possible. Combell has the required experience with this technology and Thijs came to explain this to a diverse and international audience. The presentations were all filmed and you can find Thijs’ presentation on Vimeo. You can find the slides used for this presentation on Slideshare and the feedback on Joind.in.